Deep Water Dwelling: Beyond "Us" and "Them"? Too many things!!! There is a lot to get angry about in the news at the moment. Domestic violence, atrocious treatment of refugees in detention, discrimination of LGBTIQ people in our schools, the #metoo campaign and the list goes on. I try not to read too many of the comments on social media, as this only fuels my despair and rage. I must say, that it is not only the injustice of these situations that makes my blood boil, but a deeper sense of disturbance. I have read enough and lived enough to know that our natural tendency as humans is to find a tribe, a place to belong. I do feel, however, that there is a rise in dualism and tribalism. There is much uncertainty in our society and what better way to feel safe and secure than find a group we identify with and who will watch our back. 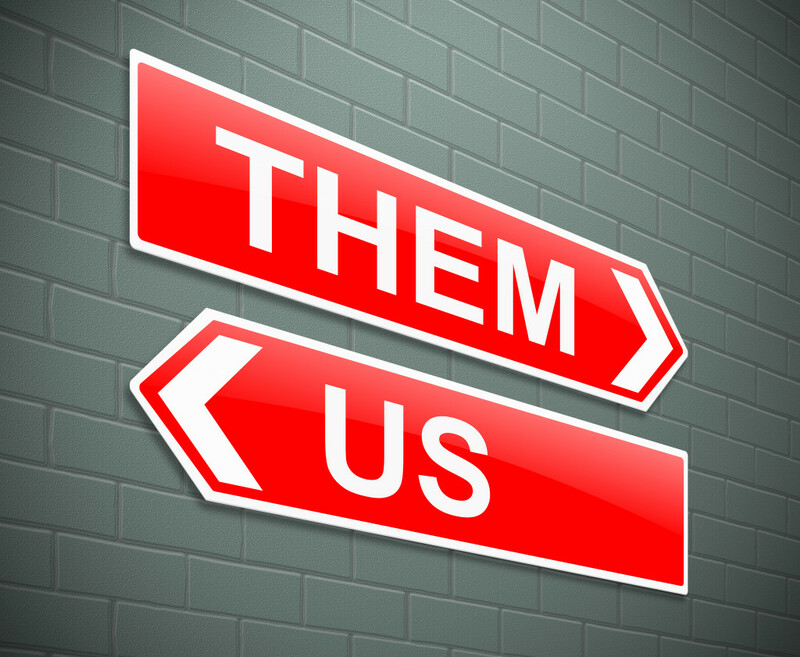 When we can identify who the "us" and the "them" are, we know where we fit, we know where we belong. People who are passionate about a cause will naturally band together to try and make a difference. Be it exposing violence against women, protecting religious freedoms, advocating for LGBTIQ people, enforcing border control, showing compassion for refugees; whenever a "tribe" is formed there is the potential to fall into an "us" and "them" mentality. Groups and movements fighting for a cause, can quickly become an angry mob defending their patch. Now, don't get me wrong, there is an integral place for coming together to support a cause, for advocacy of the vulnerable in our community and getting angry at the injustice in our world. I do feel, however, that when we take our eyes of that focus, and it becomes more about protecting the group, perhaps we fall into the trap of stroking the communal ego rather than living out our true purpose. My hope in all of this is that we can find another way; a way that is embedded in love and doesn't react out of our own fears. I don't anticipate it is an easy way. There will always be conflict and differing opinions. I often wonder if it is possible, in our humanity, to find a way that does not divide. But what would it look like to live within the paradox of life, navigating our way through the joy and suffering of differences without resorting to violence and devaluing of the other? Maybe I am just imagining utopian dreams, but I do have a hope that we are better than this. The closest I have come to even touching this possibility is through living a contemplative life. Through stillness, silence and being present, I find myself in the best possible position to live an authentic life centred on the Ground of our Being. As James Finley said, "I cannot make moments of nondual consciousness happen. I can only assume the inner stance that offers the least resistance to being overtaken by grace." There is something mysterious about deep water. Places of deep water - wells, lakes and oceans - have caught the imagination of many cultures and spiritual traditions for thousands of years. The image of the well has intrigued me in my own spiritual journey. I have grown up in a particular faith tradition, but the deeper I seek after the living water I discover an underground spring that quenches not only my well but many. Dwelling in deep water, for me, has been a place of wonder, liberation and realization. I am learning to live with the mysteries of life and this has opened me to appreciate different spiritual practices that take me to even deeper places. My hope is that 'Deep Water Dwelling' will help others to delve into their own spiritual lives and discover new and mysterious wonders. Need an excuse to be still? "Our job is to love others without stopping to inquire whether or not they are worthy." Please feel free to use any of the material on this site that may be useful in your own context. Please remember to acknowledge appropriately and let people know about this blog. I would love to hear any feedback you may have. My name is Cathie Lambert. I am a spiritual director and conduct workshops and retreats under the name Deep Water Dwelling. I live in Margaret River, Western Australia with my husband and two children. To learn more about Deep Water Dwelling look me up on Facebook. https://www.facebook.com/deepwaterdwelling/.